It’s been a windy year in Flower Mound, Texas. The rain has been in plenty, the gray days frequent, and chill common. I prefer weather in its fullness if I’m honest. Four full seasons each robust with their brightness or dullness or coldness or sweltering heat. It’s the continual sameness I struggle with and Texas, at least in our suburban sprawl of brick houses and grey roofs and concrete roads, is nothing but uniform. So while I have welcomed the wind and the rain and the gray, the two neglected trees in our front yard have not—their broken branches landing across sidewalks and in neighbor’s yards over the past few months. Our family’s yearly budget meeting had a line item for “trees” this year and today they saw their dressing down: one removed and the other now nearly naked through my office window, its canopy of ingrown branches and mid-air stumps shorn off in small neat round rings of fresh wood pockmarking its trunk. I can’t help but feel sad. It’s taken 40 years to grow them and less than 45 minutes to uproot one and prune the other. How quickly the mighty have fallen. I turned 38 a few weeks ago and I can’t stop thinking about aging now. There’s a reason they call 40 the crest of the hill and 41 over it—midlife. I feel myself nearing the top and somehow feel still so much at the bottom and quite okay with being there too. Someone called me an “older woman” recently as in the words of Paul to Titus, “Older women…teach what is good and train young women to love their husbands and children.” I balked, not at the job description but at the job title. I look ahead of me at women ten years my senior and there is such a fullness to their lives, a centeredness, a surety that I lack. I feel more like the oak in my front yard, so recently covered with brambled branches and broken off stumps and now shorn, than like the oak across the street, well cared for, its branches reaching over our neighbor’s yard in gentle slopes. These are the “older women,” I think to myself. Pruned and proven and giving shade to all. I look at the oak in my yard again, sad and surprised. I didn’t think I would feel like this when I got here. I didn’t know it would be like this. The women who mentored me along the way always seemed to have it together, to know the answers and be quick about them. They seemed to be so much further ahead at 38 than I feel at 38, but I wonder if they stared at brambled trees or naked ones, if they saw themselves there then too. I’m two weeks from finishing this manuscript and yesterday, to my almost tears, my husband reminds me of the last few miles of a marathon, when you simply put one foot in front of another, faithfully finishing, each word a wrestle, each paragraph a pull, and each page a win in itself. I wonder if growing up and growing old is like this too. If we sprint all our lives toward someday and then someday shows up in its overgrown and broken and disappointed glory and we think: 40 years I have and this is what I have? This? How can I finish this? I suppose there are some out there who feel pretty accomplished at 40, or 30 or 25, but I can’t help but think that even this feeling of “What am I even doing? Am I making a difference at all?” is producing something in us if we’ll let it. A little uncertainty and second-guessing isn’t all bad, I suppose. Nate has been reading Revelation and Eugene Peterson’s book on it, Reversed Thunder, and sharing his observations with me. I thought this morning: the only reason those seven churches needed seven words of encouragement or rebuke or exhortation is because they were doing something at all. Even if it was sometimes the wrong thing, at least they tried. Trying is my nemesis, though, thwarted as I am by fits and starts. It feels easier to not try and at least not fail than to try and fail spectacularly. The other oak in our yard couldn’t be saved. Its trunk was ringed around by a small collection of perennials, and one shasta daisy bloomed there this week, a promise of spring to come. It is all gone now, the perennials, the stump, its roots, and the daisy. Now it’s just a bed of turned up soil. I suppose there is an analogy in here somewhere of a cursed tree that doesn’t bear fruit, but mostly I find myself grateful that my office window faces the pruned tree and not the uprooted one. A reminder that all living things need pruning, even 40 year old living things, and that even shorn, naked, and seemingly dead trees will bear again in their season. My friend Lindsey Carlson recently wrote an article for The Gospel Coalition on how we see and engage with those in the church whose body size may be different than the projected “norm.” Sadly, the title (Which was probably not chosen by Lindsey, as is often the case with titling. Most of us writers have no say over the click-baity titles our editors give our pieces. I can’t tell you how many times I’ve gotten negative comments on a piece when it’s clear the commenter didn’t read further than the title…) has raised quite a GIF storm on Twitter (and I’m sure elsewhere, but who has time for that?). Though I’m sure Lindsey could have said things better or a better title could have been chosen, I was grateful the piece was written and published. More people are considered “overweight” than ever before and yet we avoid the topic like, well, an elephant in the room. As one Tweeter commented, “So this is basically an article for the 3% of the population who are at their ideal weight, and how to reach out to the other 97%.” Touche. But true. The problem is, though, not this specific piece, that it was written or published, but that it’s so rarely spoken about in the church. I was grateful Lindsey drew attention to it. One of the side effects, though, of all the hormonal changes that come with being pregnant twenty times in three and a half years is stubborn weight gain. I have spent the past few years tracking my caloric intake and macros, most days falling beneath the daily suggested calories for weight loss. Anyone who knows me would tell you gluttony isn’t an issue for me. We eat healthy, whole meals with organic produce, lots of greens, healthy fats and grass-fed meats, in moderate or small portions. I’m not going to defend our diet any more than that. Yet losing weight feels impossible. Our pastor jokes that there’s nothing to do in Dallas except work out and get plastic surgery and that’s why everyone is so beautiful. When I first moved to the Dallas area in my late twenties I came with dreadlocks in my hair and patchouli in my wake. I stuck out like a sore thumb in the land of teased blood hair, perfect noses and teeth, and sculpted bodies. I could not understand the obsession with a seemingly perfect body—a uniform look almost immediately identifying someone as “from Dallas.” I recently saw a photo of a dozen women on social media. They all wore the same basic outfit (skinny jeans, leather booties, oversized sweaters, and beanies), had the same wide, white smiles, the same soft curls in their long hair, and each had their knees cocked at just the right angle for prime photo taking. This drive to have uniform bodies and looks has created an infuriating flatness to the complexity of creation as God designed it. None of us is immune from it though. We think that by finding sameness, or friendship, with the bodies of others, we’ll find it with ourselves. The poet Jane Kenyon calls this struggle to find peace with the body a difficult friendship, “This long struggle to be at home / In the body, this difficult friendship.” We cannot seem to find peace with the bodies we’ve been given by God. This obsession, though, is not with the body, as it might seem. The obsession is not care for the body as an embodied self, or an image bearing being. The obsession is being beyond the body, beating the body we’ve been given, adding or subtracting to our substance, pressing back aging and sagging, the effects of bearing babies or losing them, working hard and growing old. This kind of care is not toward the body we’ve been given, but the body we want to have. The one we envision possible. This isn’t respectful, though, of the body we’ve been given or the person God has made us to be. And for the Christian, this matters. “Respect for the person is inseparable from respect from the body. . . . A biblical ethic is incarnational. We are made in God’s image to reflect God’s character, both in our minds and in our bodily actions. There is no division, no alienation. We are embodied beings” (Nancy Pearcey, Love Thy Body). I don’t know, maybe you’re part of the 97% (I don’t even know if that percentage is right or not), maybe your body isn’t as you want it to be or envision it to be. Or maybe your body fits the “ideal” image, but inside it’s still warring against you with sickness, auto-immune illnesses, gene mutations, infertility, cancer, disability—things that are not as it should be, and you compare your unhealthy body with what seem to be healthy bodies. I don’t know where you fall on that spectrum, but I do know this: Jesus cares about your body as it is. He cares about it as it will be someday in glory, too, but today He cares about it today. Where we see scales and percentages and confusing numbers and calories counted and antibodies rising or falling and all the things on the food pyramid we just can’t eat and all the minutes we’ve worked out, Jesus doesn’t see that. He sees a body knit together for His good purposes and for your good work—even if your best work can only be completed if your “BMI” falls outside the tiny “ideal” between underweight and overweight. I think I’m learning to see that. Losing the potential of tiny lives twenty times over and over again feels like my body is a walking tomb sometimes, only here to house death. But what if God’s good purpose for me includes embodying the gospel’s picture of these temporal bodies as bodies of death? What if being rescued from this literal body of death is preached to me better by this body that betrays me? What if this body of death reminds me again and again a better body on this side of eternity won’t satisfy, but Jesus will? Part of loving our neighbors well (beginning with not judging their bodies upon meeting them) means loving the selves we’ve been given and trusting the God who gave them to us. These are the things I’m learning about my body, as I learn (slowly) to accept it, to not berate it or resent it, even, in some ways, to love it. Maybe you needed to hear it today, too. *Please don’t email me with suggestions or questions. We have a doctor we trust and we’re navigating this on a timetable that feels doable for us. My oldest friend and me. She and I have been teaching one another how to love our bodies for over twenty years, mainly by loving one another’s bodies well. I’m rich for it. Tis the season for Top Ten lists. I keep noticing almost every list I read contains mostly books written by men, which I find not at all surprising, but a little bit saddening. About a year ago a conversation ensued on social media wherein it was reported that women read more than men, but men read more men than women. I thought perhaps, with this self-awareness, we’d see a bit of a shift in the Top Ten lists of men who write or blog, but alas, we haven’t. There are a few notable exceptions (I think of Eric Schumacher who is doing his tireless best to promote female writers in the church right now, or Steve Bezner (who someone needs to eke a book out of soon. He is, as someone on Twitter said recently, pure gold), Chuck Degroat, Seth Haines, and a few others. ), but overall the lists are out and the men have spoken: they’re still reading (or liking) mainly men. Though I know the sentiment isn’t as sweet from a woman, I thought I’d share my top ten books by women this year with the assurance that these are actually my top ten books this year—and not just a conciliatory nod toward my own gender. Women are writing more and better books and I’m deeply grateful. A Light So Lovely, by Sarah Arthur. This is a book on the spiritual legacy left by Madeleine L’Engle. I first read L’Engle because my mom wouldn’t let me read The Babysitter’s Club. What I might lack in pop-culture knowledge, I gained tenfold by becoming a voracious reader of all L’Engle’s work. No other writer has had as much influence on my voice as a writer as dear Madeleine. This book by Sarah Arthur is a masterpiece. Sacred Rhythms, by Ruth Haley Barton. Some people find Spiritual Disciplines invigorating and natural, I find them difficult to maintain and sometimes dry. On a list of books for each Enneagram type to read, Sacred Rhythms was for the 9—my type. No other book this year has convicted me as simply and peacefully as this book has. Some people need to be sucker punched for conviction, I need to be wooed. This book has encouraged me to see the beauty in God’s design for the seasons of life. Why Can’t We Be Friends, by Aimee Byrd. I honestly cannot figure out why more people aren’t talking about this book. Can’t figure out if it’s lack of curiosity or, worse, a reticence to be convicted by her words. This is a book, mainly, on friendship between opposite genders within the church. My copy is so underlined and dog-eared it’s probably unreadable by anyone else. Love Thy Body, by Nancy Pearcey. This reads more like a thesis than the self-help book the title suggests. I put off reading it because of the title until I needed it for research for my book, and I wish now more people had talked about it. There are certainly points at which I disagree with her message, but it is a book that should be read by Christians. The New Jim Crow, Michelle Alexander. I read half of this last year and half this year, over December and January, so I’m counting it for this year. This was among the most difficult reads of my year and yet I cannot recommend it more highly. You will either love this book or hate it, but you should read it and prepare your heart for honest evaluation. Born to Wander, by Michelle Van Loon. I read this one when it was just a galley and wished I’d had a hard copy to mark up and dog-ear then. It felt like reading an exposé on my own heart, its wanderlust, and desire for home. If you feel like an elect exile, but also an exile in general, I cannot recommend it more highly. It’s not a long book, but it’s a good one. All That’s Good, Hannah Anderson. Hannah never fails to incite thought in her readers. She’s never one to tell you exactly what to think, but is adept at deconstructing assumptions about, well, everything. In All That’s Good she talks about the lost art of discernment and how to practice it afresh in this information age. Gay Girl, Good God, Jackie Hill Perry. I lent my copy out so it’s not in the photo below, but the cadance you’d expect from Jackie comes through full force in this book. It’s a beautifully communicated story and I think the church needs story more than anything right now. Courage Dear Heart, Rebecca Reynolds. Rebecca is one of my favorite people on social media today. Especially on Facebook. I rarely read anything on Facebook, but if Rebecca wrote it, I will for sure read it. She posted snippets of this book as she wrote it and it whet my appetite so much that I read the whole book in one sitting when I got it. It’s written as a series of letters to those suffering, in pain, fear, and more. It’s beautiful. The Path Between Us, Suzanne Stabile. If you’re on the “Enneagram is dumb” train, you can stop reading now. I feel no need to convince you. And a mere identification of your “type” is unhelpful at best, harmful at worst. But an exploration of more can be helpful. In our family, we’ve found it helpful. This book addresses how to commune with and understand others in a very practical way. I’ve seen such fruit in such a short period of time, especially in regard to the 2s and 7s in my life. I have historically felt (sinfully) frustrated with certain types people and reading this helped me to understand what’s going on in their heads and why they think certain behavior is not only good, but necessary for the world. Bonus: In His Image, Jen Wilkin. Again, a short book (there must be a prize out there for writing three books almost the exact same length each, Jen would get it), but powerful in its message for everyone (despite the flowers on the cover). I think one of the reasons Jen’s books are of similar length and fairly short, is because her gift for clarity and conciseness in speech flows into her writing. Anyway. In His Image is about the ways we image God’s communicable attributes. It’s an excellent read for anyone, but I especially recommend giving it to young readers or new believers who might be prone to swallowing ideals divorced from God’s character about what Christians should look like. In 2017 I read more men than women (like most people), this year I tried to read more women than men. 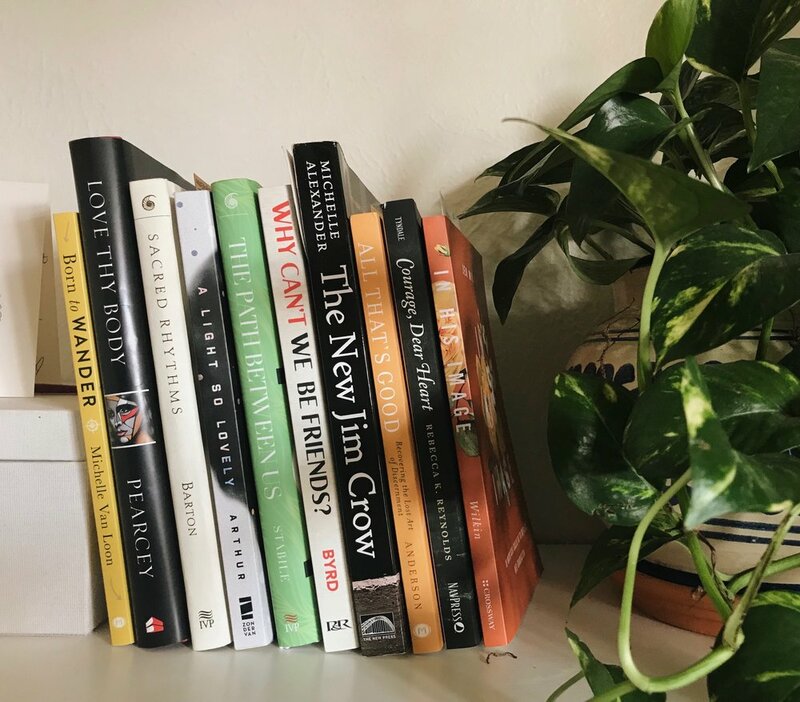 I hope 2019 is not the year of the woman or of the man, but the year of balance in who we read—and truly enjoy enough to put on our 2019 Top Ten lists. Instead of hosting unmarried friends like we usually do for holidays, Nate and I decided to use the four day weekend Thanksgiving gave us to work on some personal and marital growth. We have had two housemates for the past year and a half. One got his own place this fall and the other married two weeks ago, so we’re experiencing a tiny, tiny bit of an empty nest feeling. There’s been a sweetness to our time together that we haven’t had almost ever in our marriage. The first few years of marriage, for us, felt like holding on for dear life as we moved cross-country multiple times, began and ended jobs, tried to stay afloat in multiple new churches and communities, and dealt with some difficult blows regarding finances, safety, community, and more. Then, when we moved back to Texas into a house with four bedrooms (it’s hard to find a house with fewer where we live), we opened our home quickly to housemates. No regrets, of course. We grew and learned much about ourselves and one another in the process. There were sweet times and difficult times, as there are with every situation in which sinners are pressed up close to one another. But as we enter into a season of just the two of us in relative stability for the first time since we got married, we are excited to see what the Lord might do in us. Nate suggested we use our four day weekend as a time to do a retreat of sorts, and that’s barking right up my alley and love for Spiritual Formation of all kind. He had some suggestions for the focus and theme of our retreat and I worked through the specifics, schedule, books, etc.. We began Thursday morning and finished Sunday afternoon in time to deck the house with swags of garland (fa la la la la, la la la la). When I mentioned we were going to do this on Instagram, many asked for the content we’d use. I very specifically tailored it to Nate and me so sharing the content wouldn’t be super helpful to another couple, but if you’re interested, I shared a bit and saved under Marriage Retreat on my story highlights on Instagram. What I mainly want to reflect on here is the benefit of doing something like this for your marriage (Or your future marriage, as I said on my stories. If the Lord has marriage for you, what you’re doing today to invest in yourself will reap benefits in your marriage.). We are newbs at this whole thing, both marriage and marriage retreats, however I don’t think experience is the primary barometer by which we should measure worthwhile counsel. I am not of the belief that marriage is the pinnacle of Christian maturity, nor the most important relationship of your life. I am, however, of the belief that marriage is one illustration of the gospel, and if we want to be attentive to how we are both emulating and experiencing the gospel in our own lives and we’re married, we should give our attention to caring for our marriages. Doing a marriage retreat is one way we can do this. It doesn’t have to be at some fancy place (we did ours at home), it doesn’t have to cost thousands of dollars (our cost the price of a few books and the State Park day fee for an afternoon spent by the lake reading and reflecting—a grand total of about $60), and it doesn’t have to be the most meaningful weekend of your life. Ours consisted of personal time in the Word and time spent with two Biblical characters who shared many of our similar struggles personality-wise (Peter, for Nate, and Jonah, for me). We worked through Dan Allender’s Engaging Your Story (free, but would have been worth the cost if there was one—we both agreed this was the best part of our retreat). Then we worked through some chapters specific to areas we want to grow in personally and spiritually, and their accompanying questions. We’d spend the afternoon in conversation with one another using questions we printed off from various sources (easy to google). Our aim was to ask ourselves probing questions about our hearts and then to ask/answer one another honestly about how to love and serve one another better when we spot sin or growth in one another’s life. We turned off our phones except to check once a day, didn’t use the laptop (except to find a recipe and listen to Dan Allender’s talks), spent a lot of time outside, and generally just tried to turn our focus toward one another and God. It was simple, not fancy, not expensive, not earth-shattering. Any yet, it was so good. We unearthed some habits, sins, proclivities, and areas that have stunted our growth and our marriage. We were able to speak honestly, kindly, and faithfully to one another about the other’s sin and how it affects us. We were able to listen and repent for where we have done wrong. And we were able to laugh and enjoy just one another for four whole days. I don’t only see myself better today, I see Nate better, and I see God’s intention for us as a couple better. Marriage, for me, has felt more like trying to find a stabilizing place than it has ever felt like thriving. I have felt rocked since the day after we said “I do.” Don’t get me wrong. I love our marriage. I think we have a really, really good marriage and it is all a gift from God, not from anything we’ve done, just grace from Him. But, for me, marriage has felt like getting knocked off a cliff again and again. Like I’m Wiley Coyote and I never learn my lesson. I have felt less like myself since we married than I’ve felt in my life. One of the reasons for that, though, is my desire for fusion between the two of us overshadowed the fact that I am still very much a whole person apart from Nate. This weekend reminded me as much as I’m grateful for the ways in which we’re similar, we are still very, very, very different people. And that’s okay. This is just my short reflection on our marriage and our marriage retreat. It’s not really counsel or advice of any kind, except to say if you can do it (trade kids with another couple, ask your in-laws to keep them for a weekend, ask for help), do it. You have the rest of your lives together together. You and them and nobody else, not really, not in the same kind of covenant. One way to avoid having marriage, your spouse, or your family become an idol is by taking time regularly to intentionally see it/them rightly. So take a few days, print off a few lists of questions from the Google, get a book or two, make a schedule and mostly keep to it, check technology minimally, and get outside. Get a reset on how you see your spouse, clearly or foggily, and how you see your marriage, and how you see you moving forward together in God’s kingdom. You won’t regret it. Before I begin, in the past few months I haven’t been writing on Sayable much and I’ve gotten so many sweet messages from so many of you saying you’ve missed my words here. Thank you. Truly. Thank you. I am hard at work on the book and it’s due at the end of January. My aim is to be giving my best writing toward that project, to write a book that’s faithful to the craft and to the message, but most of all to God. Writing can be a lonely occupation sometimes and writing a book is much lonelier than writing a blog where there’s lots of feedback, comments, and interaction. Your emails have meant the world to me when they’ve come and they’ve always come at just the right moment for me, just when my energy is waning or I’m thinking, “I’m the LAST person who should be writing this book!” Thank you. You guys make the work worth it. Hopefully I won’t have used up all my words by the end of January. Your prayers are appreciated. I’m still not giving it to him until December 25th though. He can wait. The first few years of our marriage felt more like survival than thriving—because of the moves and all the other things—so we’d curve, most nights, to one another in bed with our laptop open and watch a few episodes of West Wing or some Masterpiece Mystery show. But since this summer we recommitted to not making a practice of show-watching in our bed anymore. I wish we were disciplined enough to make statements like, “We never…” but either we lack the discipline or we lack the hyperbole. Generally, though, we reserve our bed for reading, sleeping, and other bed activities. What that means is we’ve become voracious readers again and it’s been good for our minds and souls. I wanted to recommend a few books for you to put on your Christmas list or to fulfill the list of someone you love. I hope you’re better at secret keeping than I am. Sarah Arthur released A Light So Lovely, a beautiful book about the life and tension of Madeleine L’Engle. It was one of my favorite reads this year. Amiee Byrd’s Why Can’t We Be Friends is a book I want to give to everyone this year and I hope many will take me up on this recommendation. I think the Church needs this book. 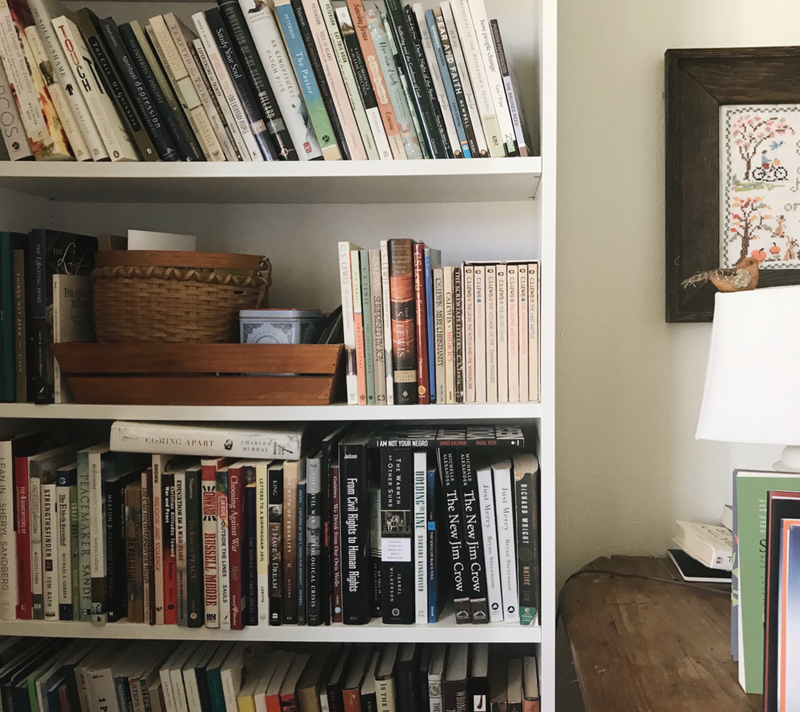 After receiving (and loving) Ruth Haley Barton’s Invitation to Retreat from IVP, I purchased her Sacred Rhythms and I had no idea how this book would feed and nourish me. If you struggle (like I do) with habit making and need a more compelling reason than the glory of being disciplined (like I do), I recommend this book. I first heard of Ragan Sutterfield on a podcast interview he did with Renovare on Wendell Berry. I immediately bought his memoir This is My Body and read it in one sitting. I loved his perspective on so many aspects of the body, the church, farming, exercise, and eating. Hannah Anderson released her newest recently and it might be my favorite of her three. All That’s Good extols the lost art of discernment and does so beautiful. We walked one of our favorite couples through pre-marital counseling this fall and used the book our church generally uses, Catching Foxes by John Henderson. I was reminded of what an excellent resource this book is, not only for new marriages but for old ones too. Fiction, with this caveat: I love good literature, but as I lay me down to sleep is not the best time for me to read great literature. These are good stories and most are well-written, winners of Pulitzers or other book awards. I reread Lila by Marilynne Robinson this year and it remains my favorite of her Gilead townspeople novels. Leif Enger recently released his newest, Virgil Wander. We are big fans of Enger’s work in our house. Peace Like a River is on both our top-ten lists. We always have Mary Oliver laying around the house, but in 2018 Nate took up writing poems and her Poetry Handbook is a staple next to his journal and Bible these days. My friend, Rachel Welcher, is releasing her newest book of poems into the world and I wept reading them. Keep an eye out for details on getting it when it releases. We keep Billy Collins in the bathroom and I’m not even embarrassed to tell you that. This is just a smattering of the books that have been laying around our home this year. I enjoyed them all and hope there’s something in here you’ll enjoy too.